What is the difference between a hydropower dam that submerges vast swaths of public land to feed our energy needs, and several massive utility-scale solar energy facilities that fragment pristine desert habitat? 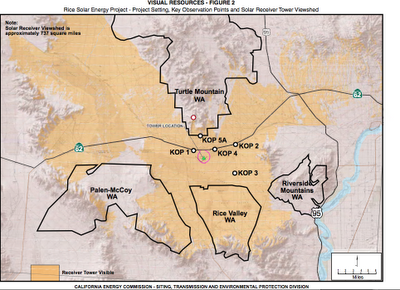 In a surprise move, Tessera Solar LLC sold its development rights on 7.2 square miles of pristine Mojave Desert habitat to K Road Solar LLC, according to an announcement on Tuesday. Tessera Solar LLC's parent company, Ireland-based NTR, could not afford to build a solar project on the site after receiving approval from the Department of the Interior. Tessera and NTR announced the sale on the same day that a lawsuit was filed against the Department of the Interior for improperly approving development on the Calico solar site, among 5 other projects. The Calico solar power project site is home to at least 22 desert tortoises, a pocket of rare desert wildflowers known as white-margined beardtongue, Mojave fringe-toed lizards, and other special status species. The Bureau of Land Management (BLM) has completed initial biological surveys of First Solar Inc's proposed "Stateline" solar power project. The surveys are part of the "Plan of Development," an initial step in the Department of the Interior's process for evaluating and approving projects proposed for public land. 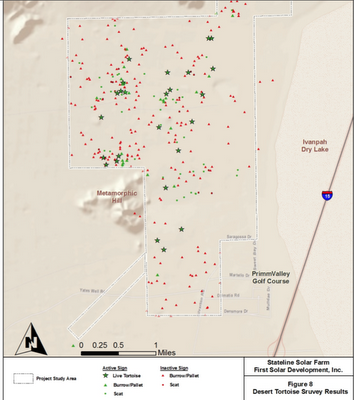 A review of the biological resources survey completed for First Solar's Stateline solar power project reveals a rich ecology on the site consistent with surveys of other nearby project sites, and suggests the public's land in the Ivanpah Valley should be conserved rather than bulldozed. 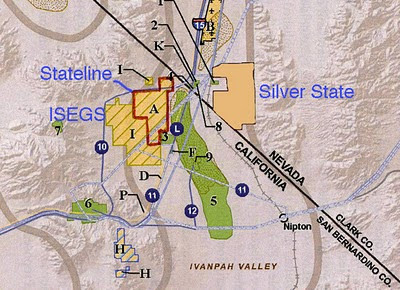 If approved, the Stateline project would destroy 3.4 square miles of pristine Mojave Desert habitat. The company is also proposing another project next to Joshua Tree National Park, and may invest in other destructive sites. First Solar Looking to Invest in Habitat Destruction? According to a Reuters article, First Solar Inc may be considering purchasing development rights for one or more of Tessera Solar LLC's projects in California's deserts. Both of Tessera Solar's projects -- Imperial Valley and Calico--are in legal limbo and Southern California Edison withdrew its power purchase agreement from the Calico Solar power project, according to the Wall Street Journal. If First Solar were to invest in either project, they could face significant hurdles, although the company does not seem to be shying away from projects that will severely fragment the Mojave and Sonoran deserts. The Mojave Desert has been pounded by nearly 5 days of rain showers that could result in another beautiful wildflower bloom next spring. As noted in Chris Clarke's Coyote Crossing, the downside is that invasive plants also benefit from the rains, and could lead to a bad wildfire season. Indigenous plant species do not provide as much fuel for wildfires as some of the non-indigenous species (and are less nutritious for foraging animals like the desert tortoise), and previous rainy seasons were followed by wildfires that can wipe out acres of old-growth vegetation that will not grow back quickly. 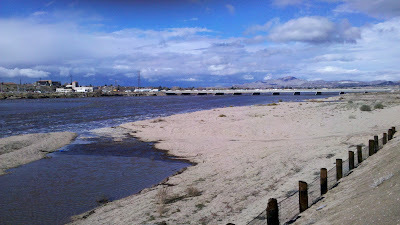 Below are some pictures of the swollen Mojave River as it passes through Victorville, California on Wednesday. The photographs were taken during a break in the weather, but heavy showers resumed in the Western Mojave Desert on Wednesday night. U.S. District Court Judge Larry Burns granted an injunction this week that prevents Tessera Solar LLC from moving forward with its Imperial Valley Solar project in response to a lawsuit filed by the Quechan Tribe against the Department of the Interior. The Imperial project would have destroyed over 9 square miles of Sonoran desert habitat that also held over 400 sites of cultural significance to the Quechan Tribe, including burial grounds. 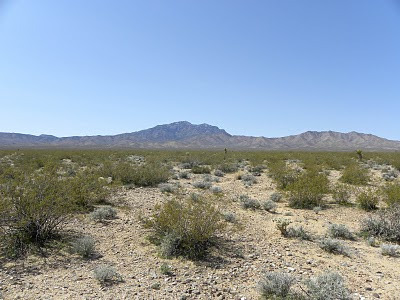 Basin and Range Watch has posted photographs of the Ivanpah Valley, before and after BrightSource Energy began bulldozing old growth desert vegetation there. I have copied a couple of the photos below, but check out the Basin and Range Watch site for a full report and aerial photos. 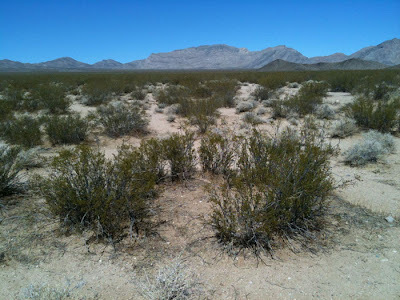 Sadly, these photos only represent the initial phase of construction, and several more square miles will be destroyed for the Ivanpah Solar Energy Generating System. 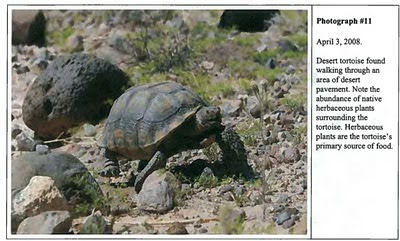 During this initial phase construction workers have displaced 40 endangered desert tortoises. You can read a previous post on another energy company's plans to add to the destruction of the Ivanpah Valley. First Solar Inc plans to built two massive facilities on nearly 15 square miles of prime tortoise habitat-- the Stateline and Silver State solar projects. Stay tuned this week for a few policy and legal developments that will have an impact on our southwestern deserts, including the Mojave. Dublin-based NTR has decided to hold off on the Calico and Imperial Solar power projects indefinitely. NTR is the parent company for Tessera Solar LLC, which received approval from the California Energy Commission and Department of the Interior to build the two utility-scale solar projects--Calico and Imperial--on a combined total of over 19 square miles of public land. According to the Irish Times, NTR did not have the financial resources available to move the projects forward, but could float stock at a later date that would bring the necessary investment to the company. The article did not suggest a timeline for when they would reconsider moving forward with the two projects. First Solar Inc. is proposing to build two projects in the Ivanpah Valley which will have significant cumulative impacts on plants and wildlife in the northeastern Mojave. Although one of First Solar's projects has already received partial approval, the company's second project can expect intense opposition. Earlier this year, BrightSource Energy's Ivanpah Solar Energy Generating System (ISEGS) was approved for construction by the Bureau of Land Management (BLM) and California Energy Commission (CEC). The ISEGS project alone will destroy 5.6 square miles and is expected to kill or displace well over 40 desert tortoises, but there are other projects planned that could continue to deprive the Ivanpah Valley of its threatened plant and wildlife. According to the latest news from Capitol Hill, the current omnibus lands bill (a combination of many proposed conservation bills into one piece of legislation) does not currently include the California Desert Protection Act of 2010 (S. 2921), or any wilderness designations in California's deserts. Senator Feinstein introduced the California Desert Protection Act of 2010 (CDPA 2010) late last year, but it has not yet been reported from the Energy and Natural Resources Committee. CDPA 2010 is unlikely to be included in an omnibus lands bill until it has passed from the committee, but time is running out. The U.S. Senate is considering legislation that would combine several land and water conservation bills into one package--called an omnibus bill--and putting it up for a vote before Congress concludes business at the end of the year. Senator Feinstein's proposed California Desert Protection Act of 2010 (CDPA 2010, S. 2921) could be a part of the omnibus bill. If CDPA 2010 is not included, or if the omnibus bill never materializes, the proposed National Monuments in California's Mojave and Sonoran deserts may never receive protected status. Tessera Solar LLC -- Constrained by Noisy Technology? Tessera Solar LLC -- the company that plans to build two large solar energy projects in Southern California--uses "SunCatcher" technology that has been criticized for its high levels of noise. Never mind the fact that Tessera Solar's two proposed sites--Calico and Imperial--would kill or displace endangered species and bulldoze cultural landmarks, once the company installs tens of thousands of "SunCatchers," it will quickly earn itself a reputation as a noisy neighbor, as well. Most solar energy companies do not have the same problem that Tessera does, since other forms of concentrating solar are quieter, and photovoltaic panels being the most adaptable since you can put a few on your rooftop. Tessera Solar LLC invented a technology that is far less pleasant to build next door, which may be why the company prefers to build in the middle of our treasured public lands. The Mojave Desert Land Trust is holding another land restoration event in Joshua Tree National Park on 11 December. You can volunteer by contacting their stewardship coordinator, Mizuki Seita at mizseita@gmail.com or call 760-366-0542. More details are available on the Land Trust's website, and you can also check their calendar for other volunteer opportunities in Joshua Tree and the Mojave National Preserve. At face value, the Rice Solar power project seems much less harmful compared to other solar projects approved by the California Energy Commission (CEC), including the destructive Ivanpah, Calico or Imperial Solar projects. The project is proposed for about 2.5 square miles of mostly privately owned land with low quality desert habitat. The project could result in the death or displacement of approximately 7 desert tortoises, a smaller impact compared to the 40 desert tortoises already found at the Ivanpah Solar project site. If it receives final approval, however, the project's small 2.5 square mile footprint will host a giant tower rising 653 feet above the ground, that could project glare comparable to half the brightness of the sun, according to CEC analysis. The tower and its glare will be visible from 737 square miles surrounding the project. The project will be visible from four separate wilderness areas. The California Energy Commission (CEC) reinstated its approval of Tessera Solar LLC's Calico Solar power project, but California Unions for Reliable Energy (CURE) and the Sierra Club are still considering litigation to stop Tessera Solar LLC from building on pristine desert habitat. Tessera Solar LLC proposed building its Calico Solar project on over 7.2 square miles of public land that is home to a high density of desert tortoises, a rare desert wildflower, and serves as a wildlife corridor for threatened bighorn sheep. If the project moves forward, Tessera Solar LLC would bulldoze the land and install over 26,000 giant "SunCatchers."